Discussion in 'Vizio Co-Star' started by jamor9391, Nov 17, 2012. I just finished setup on my co-star, and I have to say, the video quality is god awful compared to my PS3 or Roku XD. I tried both Netflix and Amazon, and neither was even watchable. All devices are setup using Speaking of Amazon, why is there no dedicated app? I have a bad feeling that I misspent $100 bucks here, so any help would be appreciated. When i get some time today, I am going to haul a setup up to my router and try to plug the box into my router directly and see if that helps, but it's not really an option -- as the TV I am going to run it on won't be able to get a cable fed. I have the PS3 and several Google TV boxes, there is no difference in video quality when playing the same source, such as Netflix, as far as I can tell. Google TV can not play movies in HD from Amazon, at least as of the last time I checked but TV shows can be played in HD. As far as why there is no Amazon app for Google TV, I don't know the answer but I use the PS3 instead of Google TV for Amazon and will until there is a proper Google TV app for Amazon, hopefully that will happen soon but I have seen nothing that would make me believe that. For most internet streaming I use Google TV because it can access so much more than many other streaming boxes including the Roku boxes. I pray that you are not using a WiFi connection with your Co-Star, that's a no no ... What is your broadband speed? Also what's the name of your router ...? If the Vizio Co-Star is set up correctly with the right parameters, it will run/work smooth as silk 24/7 ....! Yeah, I am using wi-fi, what good is one of those devices if it's required to be plugged in. I'll grab the rest of the information tomorrow, but I have to say, it's disappointing I can't use it on my main TV, as I really like the screen overlay quite a bit. I only use Wi-Fi, picture quality is excellent given a good quality source with Google TV but finding a good quality source isn't always easy with internet TV. Any claims that there is something inherent with Google TV that would make the picture quality inferior to the PS3 or Roku or other streaming box is just a false claim, something else is causing any difference when there is one. If there was a difference like that, an independent testing site would have uncovered it long ago, no such difference has been documented. Have you tried running a speedtest? I have a hunch that the issue could be the way your router interacts with GTV. It's difficult explaining this to people because yes other devices on your network will show good speed results and you can view web pages with Chrome etc on your Co-Star. But I would first try some trouble-shooting measures involving your router. Can you remove your router from your setup (as a troble-shooting measure) and connect directly to modem? *See the speed test in the above photo, "SPEED" is the name of the "GAME FUEL" for the Vizio Co-Star, without the speed fuel behind your Vizio Co-Star you are asking for trouble ...! Nothing Google TV can stream from the internet requires ultra fast speeds, in fact I can't think of any internet streaming that would exceed 5Mbps accessible by Google TV, most sources are in the 2Mbps range or less. My internet service is U-verse with download speeds are up to 12Mbps, I have no issues with any streaming sources. If downloading files is important, no question that quicker download speeds could be helpful but I don't download files much. A good router with consistent connection speeds above the required speed is important of course but speeds like I see work great for Google TV. People all I'm doing is trying to help/tell you how to get the best streaming experience out of your Vizio Co-Star ... That is if you want high quality streaming video without lag with picture pixel crystal clear video resolution quality ...! If the Vizio Co-Star required 20Mbps download speeds for acceptable streaming quality, that requirement would be on the box. It isn't because it doesn't. Clearly faster speeds won't hurt but 20Mbps is absolutely not necessary for the Co-Star or any Google TV device with any streaming available today and as far as I know, not required for any service with any streaming box. I'm going to repeat What I said...! Now look at the word (BEST) ...! Why do people want to take your words out of context and even change them to say something you never ever said .... (BEST) (BEST) (BEST) If you want the BEST streaming experience with the Co-Star .....! That's why a lot of people need to read the book "Google TV Devices For Dummies" ....! I have the Logitech Revue (OS 3.1) and I currently have a download speed of only 3.2 mbps. I'm hardwired directly to the modem. My TV is a 720P Vizio 32" TV. I find for my needs that even 3.2 mbps down is plenty good enough. I'm able to stream 720P HD videos from Vimeo, YouTube web site and the YouTube app. I don't really care about 1080P video - but in order to stream 1080P video I could accomplish that by pausing the video for a while and letting it buffer. Usually I don't even need to pause to buffer for 720P videos. 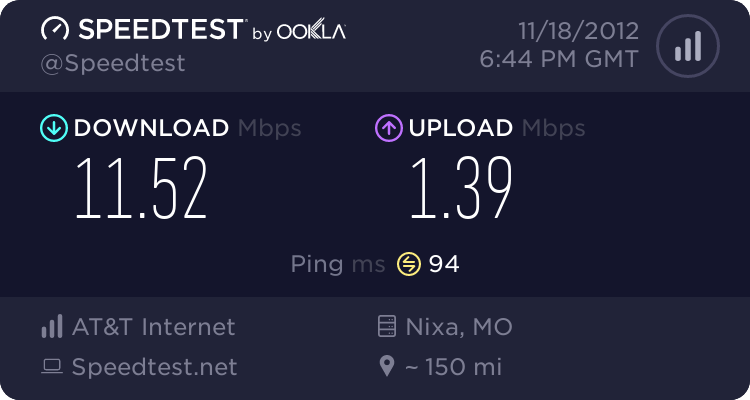 I feel the occassional "glitches" that I run into such as Shockwave crashes, web pages freezing, the "Aw Snap" message, etc are things that wouldn't be improved upon by my "wasting" money for a higher speed internet service. I suspect "most" of the problems GTV users run into are do to Flash being inherently unstable, glitches specific to web sites and apps, hardware limitations of GTV devices, GTV OS bugs, and router/wi-fi issues. Obviously if you stream a lot of 1080P videos a faster internet service is more important. I'm talking about the BEST, you people are talking about what you need and what you can get by with ....! I want the BEST and I got the BEST ...! Go ahead and provide some science to support the claim that 20Mbps speed is going to make streaming these sub 5Mbps sources better, I would like to read about how that could be. I have never read nor seen anything that would make me believe that could be true. As long as the speed is consistently above the required speed, no difference will be observed and most of the streaming sources I use with Google TV are 2Mbps or less and I have never seen anything above 5Mbps and if anybody knows of a streaming source that ever exceeds 5Mbps accessible by Google TV, let me know what it is, I would like to check it out. There are more ways than ever to get your video these days. Here's how to set up your network to avoid slow, lagging video streams. I pray this article will help somebody and enlighten others ....! The average wireless router typically sits quietly doing its job of routing traffic between the Internet and your private home network-and not much else. But it can do so much more, especially if you know how to tweak its settings. Last time, we showed you how to set up your router for gaming. In this piece, I'll show you how to make your router video-friendly by optimizing it for high-definition video streaming. Many network users want to stream video from gaming consoles, NAS devices, or Blu-Ray players to other devices within a home network. For example, I have a home media server that stores video files. I want to stream these videos to wireless clients in my home like tablets or smartphones and want to get the best performance I can while streaming. Performance, in this case, is fairly easy to maximize because the streaming from the source is happening locally, within the network, from the source to the client devices-provided you have the right equipment. Keep in mind that the devices that you stream from, such as gaming consoles "Vizio Co-Star" or NASes, you will want to connect with an Ethernet cable to one of the LAN ports on a router. You'll get much faster speed than with a wireless connection. Newer routers and wireless clients like the iPad support WMM (Wireless Multimedia). WMM is used to allow specific kinds of wireless traffic (like video) to be set to high priority-working very much like QoS but requiring less configuration. If you continue to have problems with video, try enabling WMM settings on your router and wireless clients. Gonna have to agree with Chris...20mb down is not gonna do any better video quality then 10mb when talking google tv alone....now if you have multiple devices running on your network all at the same time..(ie..Xbox, ps3, multiple computers, iPad)... Then yes 20mb will help. But trust me in saying you will not get any better video quality on you google tv box if you have 20 or 10mb and that's the only device on your network. I have an Xbox, 2 computers, iPad, connected tv, and a few other connected devices and have 12mb down and 3mb up and if I'm playing cod online with my Xbox, I can also stream hd with my iPad and gtv using Netflix at the same time. You don't need 20mb for your co costar so please stop recommending it to people. What's so special about those speeds? I've been running slingbox's for a decade and these days anything under a 1mb remote stream isn't anything to write home about especially on a connected device. You'd be lucky to get a consistent 640 x 240 resolution from your slingbox to your co-star if your speeds are fluctuating between 400 and 850 Kbps.